Toast is one of my favourite things to have for breakfast. But….I also get bored easily and plain old toast with peanut butter is usually only good for a day or two until I need a different kind of toast. Different bread, different topping, different in some way, shape or form. Enter breakfast pitas. I love these things. My family and I first became addicted to them when we discovered the ones they sell at Costco. So, so good. Those ones are flax seed ones, and they are absolutely wonderful toasted for breakfast with some peanut butter and jam. If toast is your thing. So of course, I needed to recreate them. Naturally. If you’re going to be buying something constantly, you might as well be able to make it yourself, right? Right. Those flax seed, whole grain pitas took a few tries to recreate to my satisfaction, but they are amazing. And actually quite easy to make. So then I needed to try some new flavours. Because I can’t just leave well enough alone. Also, bored easily. 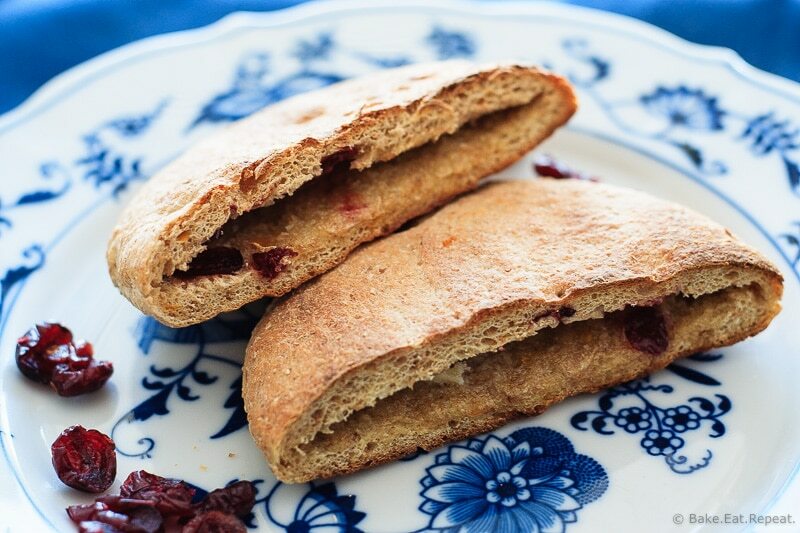 These cranberry orange breakfast pitas were just as amazing as the whole grain ones. We loved them. And again, they are quite easy to make. I will say though, that they’re a little more finicky in the puffing department. They definitely don’t puff as easily as regular pita bread. In fact, it’s a little hit and miss with the puffing, in that they usually don’t puff all that much. But it’s okay. We’re just using them for toast, and they’re also a bit thicker than your typical pita bread, so it’s actually quite simple to cut a pocket into the bread with a knife after you toast it. We enjoyed these for breakfast toasted with a little butter, or some jam. No more boring toast for breakfast! 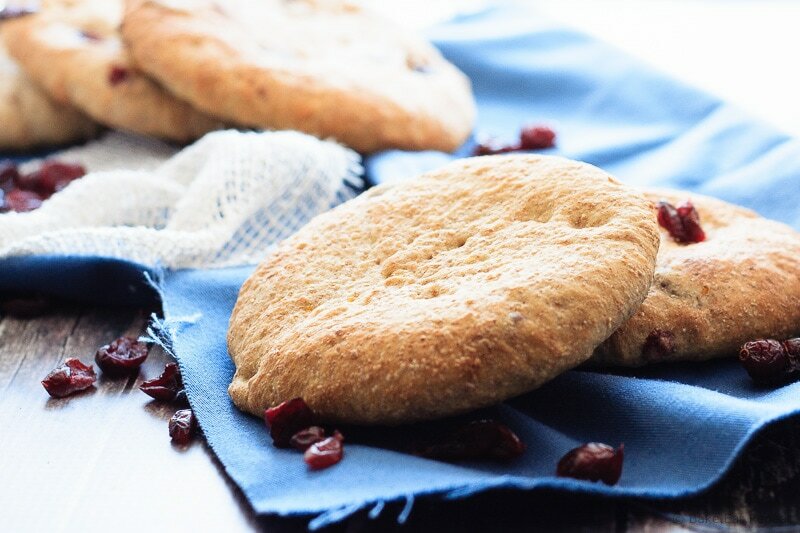 I shared this Cranberry Orange Breakfast Pita recipe over at Cupcakes and Kale Chips last week, so head on over there to check it out! Note: As with any yeast bread, the amount of flour can fluctuate a bit depending on a number of factors, go by the look of the dough. This dough is quite tacky but not sticky, and should clear the sides of the bowl when enough flour has been added. I use the scoop and sweep method of measuring flour. The water should feel very warm to the touch, but not hot. These pitas don’t puff up dramatically in the oven, just slightly, and sometimes not at all. Don’t worry, they’re still delicious, and quite thick so you can easily slice a pocket into them with a knife! Make the soaker - in a small bowl, combine the flax meal, rolled oats, wheat bran and water until everything is evenly moistened. Cover with plastic wrap, and allow it to sit at room temperature for at least an hour and up to overnight. 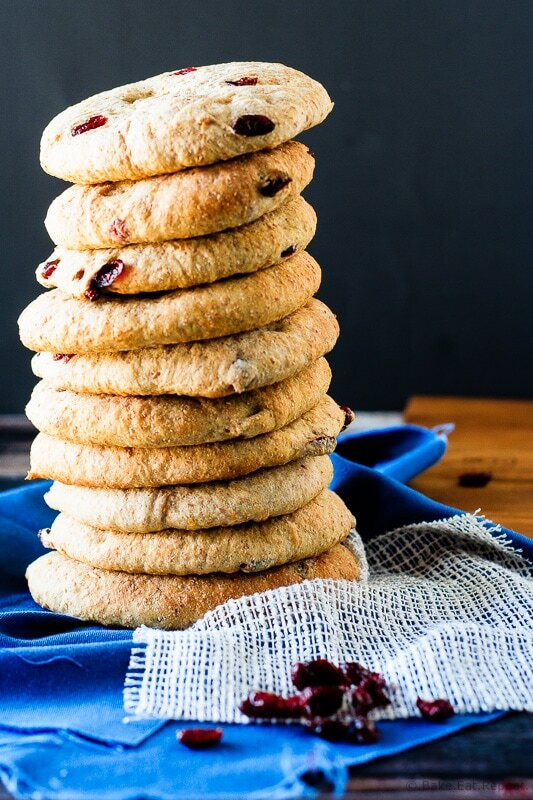 In a large bowl, or the bowl of a stand mixer with the dough hook attached, combine the soaker with all of the dough ingredients except the cranberries. Mix on low speed until the dough comes together and clears the sides of the bowl. If it’s too wet and isn’t clearing the sides of the bowl, add more flour, one or two tablespoons at a time until it clears the sides. If it’s really dry and isn’t tacky at all, with dry bits not coming together, then add more water a tablespoon at a time until it all comes together. Knead the dough for 8 to 10 minutes by machine, or 12 to 15 minutes by hand. Add the cranberries in the last couple minutes of kneading. Transfer the dough to a lightly oiled bowl, turning it to coat it with oil (it will be sticky) and cover the bowl tightly with plastic wrap. Let it rise until it has doubled, about 90 minutes. Preheat the oven to 500 degrees F. If you have a baking stone, place it in the oven to heat. Punch the dough down, and move it to a lightly floured surface. Divide the dough into 10 equal pieces (I don’t bother weighing, just eyeball it!) and let them rest, covered, for 10 minutes. Roll out each dough ball on a floured surface to a 6 inch circle. Let them rest on parchment paper for 5-10 minutes to puff up a bit. Slide the parchment onto the hot stone (or a baking sheet, or you can place the pitas directly on the hot stone without any parchment paper if you prefer) and bake for 8-10 minutes until they are slightly puffed and lightly browned. You can bake in batches, the others are fine resting for a little longer. Let them cool on a wire rack. Store them in a sealed plastic bag, making sure they are completely cooled before storing. These pitas are best the first couple days after baking, and then start to dry out fairly quickly, but can be frozen for up to 3 months. If you’re toasting it for breakfast, it can be toasted without defrosting. I love this! I've never thought to eat pitas for breakfast before, but they look so delicious! Breakfast pitas are the best! Although I will say I thought it was a strange idea the first time I saw them - but I got on board with it pretty quickly! :) Thanks Izzy! I love the idea of making my own pitas! Heading over to check out the recipe! Gorgeous photos Stacey! Oh I love that you made homemade breakfast pitas! I went through a phase where I bought them all the time - I need to just make it myself. And cranberry orange is just the best! We go through phases with them too, sometimes buying them incessantly. That's what made me try to make them! Thanks Ashley! Homemade pita bread? You sound like a star baker!! I do love the cranberry and orange combo! Hahaha, star baker? I wish! Pita bread is super easy, it just looks hard! :) Thanks Beth! Breakfast pitas are such a good idea, Stacey! I get tired of toast after a while, too, so I'm loving this idea. Sounds delicious with the orange and cranberry flavor! Yeah, I need to change it up or I get bored - these were a great change, plus now I feel the need to try all sorts of other flavours! :) Thanks Gayle! Thanks Maryanne! They're super tasty for breakfast! How fun, what a creative idea! That's so clever Stacey, I love this recipe!! Love this idea! The cranberry orange flavors sound delicious. Cranberry and orange are so tasty together - we loved these! Thanks Maris! Totally agree on the apple chips - we only ever make them because I refuse to pay for them! Plus, the kids like making them, although they disappear way too fast! Thanks Erin!